HV Hydraulic S.r.l., in collaboration with the “Dozza Città d’Arte” Foundation and the Studio Associato BioRes Restorations, has decided to further consolidate the harmonious relationship that it has already established with the territory on which it operates, through an ambitious project of cultural patronage aimed at reviving the original splendour of some precious environments and decorations within the Rocca Sforzesca Fortress of Dozza, which to this day remain hidden and not accessible but have so much to tell. The project realizes the desire to protect and promote culture, a fundamental resource, which is of great help to the business community operating in Italy and abroad. This involvement arises not only from a firm belief in civil participation but also from the certainty that investing in Made in Italy, in the skills, traditions, culture of the country, is the best way to make it more competitive and therefore, giving all the people who live and work in this country, who love their history and traditions better opportunities. Supporting culture, for which Italy is the world leader, undoubtedly serves to keep our country's reputation high, to make sure that more and more people from all over the world want to visit it and, in this way, also supporting the real economy, which creates new jobs especially for young people. This is, therefore, the tribute that HV Hydraulic S.r.l. wants to make to Italy, to guarantee a better future thanks to the protection of its past and its roots, of which art has become the emblem. Rocca di Dozza - HV Hydraulic S.r.l. The origins of Dozza date back to ancient times. Inhabited since the Bronze Age, the place was first subjected to the Gauls, then to the Romans. The primitive settlement, founded in Roman times, was enclosed by walls in 1086 and provided with a tower by the Bolognese, on the only entrance to the hamlet, resulting in the current town centre. In 1198, the Guelph Bologna managed to seize the castle, causing the exodus of the population of Dozza siding with the Ghibellines who fled to Imola. In 1310, thanks to the initiative of Romeo Pepoli, Commissioner of the war, the Rocca was fortified and rebuilt by the Bolognese in the middle of the thirteenth century. In 1412 Dozza became a feud of the Alidosi family of Imola and then of the Riario family. In 1494 the feud was under the rule of Caterina Sforza, wife of Girolamo Riario, who held it until 1499 when it was conquered by Cesare Borgia, and shortly after returned to the State of the Church. In 1529, after a brief period of the Lordship of the Malvezzi family of Bologna, Dozza was ceded by Pope Clement VII in the feud to Cardinal Lorenzo Campeggi. In 1728, with the death of Lorenzo Campeggi, the marquisate of Dozza came to Francesca Maria Campeggi, the wife of Matteo Malvezzi, thus forming the inseparable pair of surnames. In 1830 Dozza returned to being part of the State of the Church, until it became an autonomous municipality in 1861, with the proclamation of the Kingdom of Italy. The Rocca was built in 1250 by the Municipality of Bologna and enlarged in 1310 by Romeo Pepoli. The current appearance is due to the architect Giorgio Marchesi who worked there at the end of the fifteenth century when the Rocca was under the rule of Caterina Sforza, rebuilding part of the curtain walls and fortifying it with the main tower, the Torresino, a splendid example of late fifteenth-century military architecture. These works lost most of the traces of the old medieval building. The transformation of the Rocca from a purely military structure into a stately mansion was started by Annibale, Baldassarre and Vincenzo Campeggi, who occupied the building in 1565 and was completed by Antonio Campeggi in 1594. The renovation work and expansion of the mighty building was entrusted to the Massari of Dozza and continued until 1594, with the aim of obtaining spacious and respectable environments suited to the functions of the feudal representative site of the Rocca. In 1798, in the Napoleonic period, the Rocca was on the verge of being confiscated, but the Marquis Giacomo Malvezzi-Campeggi managed to avoid this situation claiming the property. This stately home was opened to the public in 1960 when the building was purchased by the Municipality, thanks also to the support of the Province of Bologna. 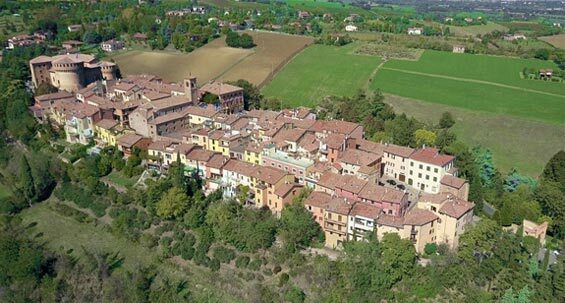 In 1999 a complete project for the renovation and redevelopment of the Rocca was started, which is still underway, financed by the Municipality and the Emilia-Romagna Region. The internal courtyard of the Rocca consists of three Renaissance-style lodges covered with cross vaults, supported by sandstone columns with decorated capitals. In some places, you can see traces of the rich decorations that once covered the vault and the walls of these rooms. The Chapel dedicated to Santa Barbara was probably realized during the seventeenth-century interventions for the enlargement of the Great Hall. In the inventories of the Rocca of 1795 and 1812 the Chapel is documented, complete with altar and sacred furnishings. The small private chapel disappeared in the nineteenth century following the transformations of the kitchen on the ground floor and the construction of a dumbwaiter and new chimneys that occupy part of the room. Traces of the ancient pictorial decoration that emerge from the white painting evenly stretched out on the surfaces are still visible on the walls. To complete the noble apartment there is a private Studiolo of eighteenth-century taste with a panoramic view from the terrace facing west. The Studiolo included, in addition to furniture, a long list of small paintings of various subjects carefully framed and fixed to the wall with red cords intoned with the tapestries, red as in the other rooms of the apartment. In the painted vault, elegant monochromatic phytomorphic decorations are depicted in decorated frames.